The Government urged the Supreme Court to improve the draft Memorandum of Procedure after the Supreme Court's judgment on former Calcutta High Court Judge, Justice C.S. Karnan, the Ministry of Law and Justice told the Lok Sabha on Wednesday. The answer was tabled in response to a question raised by AIADMK MP Mr. J.J.T. Natterjee, who, among other things, sought to know the steps taken to ensure transparency in the appointment of Judges. 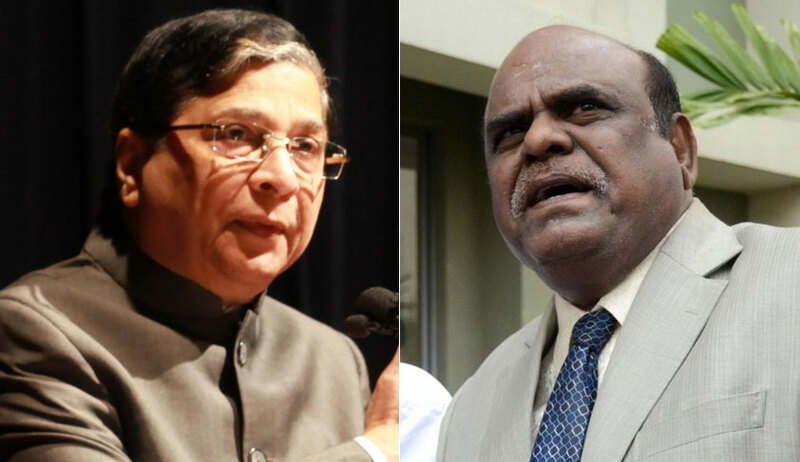 ... Supreme Court in another judgment dated 4.7.2017 in a Suo Moto Contempt Proceeding against a Judge of the Calcutta High Court, two Judges of the Supreme Court Bench noted the need to revisit the process of selection and appointment of Judges to the Constitutional Courts. The Government of India has conveyed the need to make improvement on the draft MoP to the Supreme Court vide letter dated 11.07.2017." A seven Judge Bench of the Supreme Court had sentenced Justice Karnan to six months imprisonment after finding him guilty of contempt of Court. The Court had then highlighted the need for a mechanism to consider suitability of candidates before appointing them and had observed, " This case, in our opinion, has importance extending beyond the immediate problem. This case highlights two things, (1) the need to revisit the process of selection and appointment of judges to the constitutional courts, for that matter any member of the judiciary at all levels; and (2) the need to set up appropriate legal regime to deal with situations where the conduct of a Judge of a constitutional court requires corrective measures - other than impeachment – to be taken. The conduct of the contemnor ever since his elevation to the bench has been controversial. Obviously, there is a failure to make an assessment of the personality of the contemnor at the time of recommending his name for elevation. Our purpose is not to point fingers to individuals who were responsible for recommendation but only to highlight the system’s failure of not providing an appropriate procedure for making such an assessment. What appropriate mechanism would be suitable for assessing the personality of the candidate who is being considered for appointment to be a member of a constitutional court is a matter which is to be identified after an appropriate debate by all the concerned – the Bar, the Bench, the State and Civil Society. But the need appears to be unquestionable."